154 Hidden Court: Junk mail. There's something really extra exciting about opening the mailbox every day and getting things addressed to ME! for ME! about ME! I get that it's all advertisements because I know nobody really writes REAL letters any more, and I think that even paper Christmas cards are falling by the wayside, which is a darn shame. Don't misunderstand me here. I love a good text message, tweet, Facebook post and email as much as the next gal, but there's something really refreshing about walking to the mailbox and pulling out something that's yours to look at. Except for the darn bills, that is. Well, those, and the mountains of junk mail and catalogs that make their way into my mailbox daily, diluting the joy I feel when I get real mail, like my Entertainment Weekly magazine or my ThinkGeek catalog. Then not long ago, I had a really happy accident. We were going to be out of town for a few days and I was debating whether or not to stop mail delivery while we were gone. I knew I could do that online at the USPS site, but because I was sitting two whole rooms away from my computer, I decided to see if there was an app I could download to my iPhone. This is laziness at it's best, people. 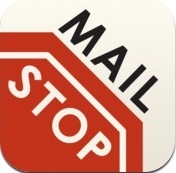 So anyway, without bothering to read the description, I downloaded an app called "MailStop." When I actually opened the app, I realized it wasn't exactly what I initially thought it might be. Instead, it was an app that allowed you to take a picture of the label from your junk mail, submit it, and TADA! no more junk mail from that particular place. It's like some sort of sorcery. Since my accidental download, I have sent in DOZENS of requests to catalogs like American Girl, which clearly I do not need, and to a plus sized clothing catalog that I have been receiving for years. I suspect my mother-in-law may have signed me up for that one, but I don't have any proof of that assumption. Anyway, I know the app works, because a couple days after I snapped a pic of the mailing label from a catalog I used to use for work (way back when I worked) I received a "sorry to see you go" email from them. By the way, this is not a sponsored, coerced or otherwise directed post. I'm just telling you about it because I think it's really cool, and you maybe should give it a try. But for now, I'm off to delete myself from some more mailing lists. Hmmmmm.... I wonder what would happen if I requested a stop on my utility bills?